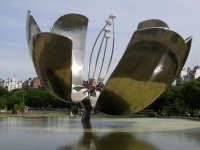 Floralis Generica is a working metal sculpture located in the United Nations square in Recoleta. Floralis Generica is composed of stainless steel, weighing 18 tons and measuring 76 feet (23m) high. It was offered to the city by Argentine architect Eduardo Fernando Catalano, who described it as an 'environmental structure'. Its metallic petals open and close based on the incidence of solar rays and visitors to the site will find the giant metal sculpture 'in full bloom' in the heat of the day and closed at night. The sheer genius and technical artistry of the giant flower makes it a sight worth seeing in Buenos Aires. The sculpture sits above a reflecting pond, adding to its charm, and the area around it has been landscaped to resemble woodlands with several paths leading to the sculpture from different directions, providing contrasting perspectives.